For being spiritual, good nourishment is essential. The vegetarian, seeking his joy of life in the non-violent respect for all living beings, must be more careful with his diet than a meat eater. He must garner his vitamins, proteins and minerals more than a meat eater has to. For a piece of meat is a kind of vitamine pill. But a piece of meat also gives toxic waste like ammonia when broken down in one's digestive tract and that on its turn gives, according some studies, cancer of the colon and problems with e.g. one's vitamine D household which regulates the absorption of calcium and other minerals. Vitamin D is also built up by the body catching sunlight tegularly. 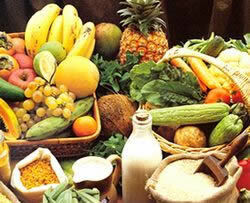 Older people need to pay special attention concerning vitamins. When a vegetarian consumes different kinds of vegetables, cereal, beans, milk and fruits with a proper alternation and combined eventually with nuts and seeds as an extra source of protein, he will suffer no lack whatsoever (veganists must eat sea weed or another B12 product, and lacto vegetarians in case of a lactose allergy must simply only eat fermented dairy like cheese). A point of attention are the fatty acids omega 3 & 6, good for one's brain, ones immunity, ones circulation and the growth of cartilage e.g. and other tissues. They are essentially a kind of vitamins because they cannot be produced by the body itself. They are supplied by a cheese sandwich each day or by one or two table spoons of linseed oil (or having fatty fish as a meat eater). Much of the hunger of meat eaters is purely a conditioned, fake kind of hunger that only, with the consumption of sugar and non-essentail fat, leads to overweight and such, including the accompanying welfare diseases (of diabetes, heart troubles etc. ). If one regularly eats vegetarian food though and even so now and then for a day takes to a fast on fruit juice and milk (e.g. once in the fifteen days with the regularity of the sun and the moon, see vko), one may even increase one's life span with five to ten years, so we may conclude from scientific research data on the life expectancies of old aged vegetarians. Do not eat too much nor too little and thus be hearty and hale; a good diet is the key to a healthy life! For those who doubt the correctness of these positions taken, we below present a table offering an overview of all the essential vitamins. The need for protein, which for the vegetarian is covered by the consumption of the complementary proteins of cereal and beans, is in combination with these vitamins, as you can see, also perfectly covered by a diet of beans, cereal, milk vegetables and fruits, and with the variegation of the foodstuffs presented below you will suffer no lack of any kind of mineral when you regularly eat figs, spinach en broccoli for your iron. Pills are not needed thus, being a conscientious vegetarian! Sore mouth, insomnia, burning eyes, flaky skin at the sides of the nose. Needed for formation of body cells and red blood cells; prevents spina bifida in the fetus. - This table was also published in HP de Tijd (a dutch magazine) of 11 Sept. 2005. - Vitamin F is an obsolete term for the essential fatty acids omega 3 en 6. A good cheese sandwich or one or two table spoons of linseed oil supplies for your daily need. - Selenium is an element common in animal products and is good for one's immune system and fights the symptoms of aging; it is found in Brazil nuts (a lot, a few suffices), bread (10% a slice) and pasta (50% each meal). - Beware of artificial vitamins, they can unsettle your biochemistry and immune system. The artificial D in margarine e.g. is known to be the cause of problems with the calcium management of the body in case of an excess. Eat for that reason always natural food stuff; fresh butter e.g., but do so sparingly because of the cholesterol in that case. - Ovo-vegetaranism: a form of vegetarianism eating eggs, but no dairy. For the production of eggs many male chicken are shredded. - Lacto-ovo-vegetarianism: one consumes dairy products and eggs. This is currently the most common variety in the Western world. .
-Fish-vegetarianism: they eat like lacto-vegetarians, but also without the fish; in fact these are no real vegetarians for they eat cold blooded animals. -Veganist: a form of vegetarianism not consuming anything of the animal kingdom nor do they use leather products. These folks have to mind their vitamin B12 and wear plastic or linen shoes. They have to consume linseed oil for their essential fatty acids. - Only fruit: the most extreme form of vegetarianism. People only eating fruit not only respect animal life, but also tree and plant life. Therefore they eat (in the most extreme cases) only fruits and nuts, which allows trees and plants to live and because the fruits and nuts were meant to serve as food. These people have to consume food supplements in order not to suffer deficiencies, for fruit only is too one-sided as a food source, in nature e.g. become chimpanzees, who only eat fruits and leaves, after a few days aggressive and do they kill another monkey to consume it for their proteins and vitamins. People have an almost identical digestive system as monkeys. Gorillas being purely plant feeders e.g. have to eat all day through and lick stones to gather their minerals and other nutritional substances. - See wikipedia for more about nutrients. - Read more about the body and the spiritual essence. - Links: of the vegetarian society, vegetarisme.nl and the Order of Time Linking Library. - Vegetarian Recipes and Resources: Vegetarianism is especially recommended for those who want to follow a truly spiritual lifestyle. To slim down: Buy a scale and check your weight daily. Eat every other day only fruit and milk (buttermilk is the best). Reckon two days for every pound of overweight. for a minimum of twelve days in alternation. For your ideal weight you must continue this regime for about one or two weeks more. you must manage to maintain this by adapting your discipline of foodintake. Then just eat some more or less, but not differently just like that. You thus don't change your diet, but still slim down. Always take care to ingest the nutrients that you need (see above). even though one is slimming down. Personal support? Send an email | Still want a diet change? See above or this wikipage. © 2006 The Order of Time:. Noncommercial use permitted.